A third feature that we should notice is the position and role of Adam, the primal human, in the context of God’s creation. He is given the responsibility of naming the animals, “all the birds of heaven and all the wild beasts” (Gen. 2:20). The Church fathers read this as follows: naming God’s creatures in accord with the intelligibility placed in them by the Creator, Adam is the first scientist and philosopher, for he is, quite literally, “cataloguing” the world he sees around him. (Kata Logon means “according to the word”). From the beginning, the author is telling us, God accords to his rational creatures the privilege of participating, through their own acts of intelligence, in God’s intelligent ordering of the world. This is why, too, Adam is told, not to dominate the world, but precisely to “cultivate and care for it” (Gen. 2: 16), perpetuating thereby the non-violence of the creative act. 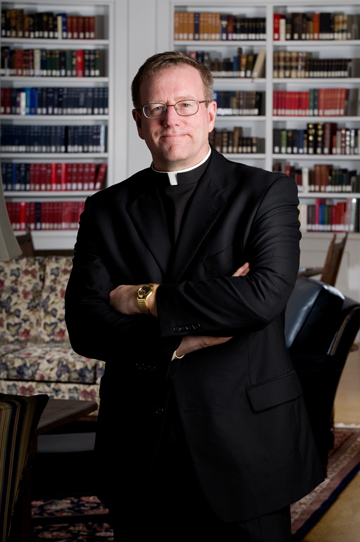 Father Robert Barron is the founder of the global ministry Word on Fire and the Francis Cardinal George Professor of Faith and Culture at University of St. Mary of the Lake in Mundelein. He is also the creator and host of a new ten episode documentary series called “Catholicism“ and host of a weekly program on WGN America, Relevant Radio, EWTN and at www.WordOnFire.org.